This entry was posted on August 17, 2018 by MAV Europe. They live within and on us. We need them every day in order to live a healthy life, we are speaking of the countless microorganisms that reside in our bodies. For a long time we thought that most bacteria were harmful; but in the last ten years, scientists like Dr. Keith Wallace have discovered their astonishingly beneficial effects. Join us and Dr. Wallace for a journey through the incredible world of lower gut bacteria. Embedded within traditional Ayurvedic knowledge are fascinating links between the microbiome, your mood and health. The term microbiome refers to all the microorganisms living within and on us, and the genetic material they contain. 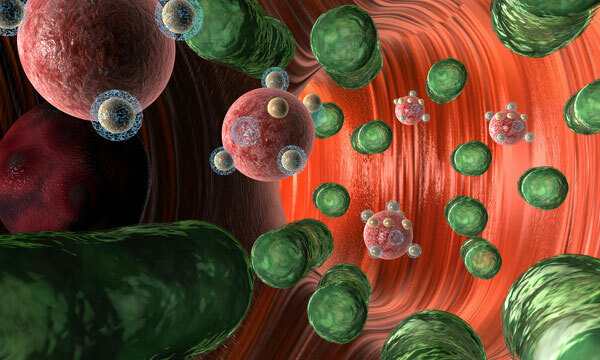 Today it is estimated that there are nearly 30 trillion microorganisms living in or on each person. The lower gut contains 99% of all the microorganisms in the body. It is primarily composed of bacteria living in a densely-populated ecosystem, consisting of 500 to 1000 different species. Whoever thinks that lower gut bacteria are only responsible for digestion is seriously misinformed. Their effects go far beyond the gastrointestinal tract! These “housemates” influence our moods, as well as our mental and physical health. “These bacteria control everything and are very beneficial,” said Dr. Wallace during a fascinating presentation that you can watch in its entirety on YouTube. The importance of our intestines and their flora can be seen in the fact that the gastrointestinal wall houses 80% of our immune system, as well as secondary nervous and endocrine systems. Much more information flows from there to the brain than the other way around! Whether we were born naturally or by Caesarean section, our age, how we nourish ourselves, whether we get regular exercise, what we eat, and what medications we take ... all of these factors affect the microbiome in our gut, sometimes over a very long period of time. Based on the composition of someone’s lower gut bacteria, we can often recognize in adults, whether they have been delivered by Caesarean section. Although antibiotics are certainly helpful under certain circumstances, even they can negatively alter the lower gut flora over the course of months or even years. Furthermore, poor nutritional habits, unhealthy foods, as well as a lack of nutritional diversity, an exaggerated sense of cleanliness, smoking, age, and chronic stress, in particular, can contribute to an unbalanced mix of lower gut bacteria. We have known since ancient times that the cause of most diseases lies in the lower gut. In Western culture, just as in Ayurveda, we find it in Hippocates. In the last few years, contemporary microbiome research has been able to explain why this is so. Today we know that the brain and lower gut are in constant communication with one another. As a result, chronic stress negatively affects the intestinal flora, while intestinal bacteria can influence mental health. Thanks to knowledge gained through modern microbiome research, we now have an even greater understanding of what Ayurveda has taught for thousands of years. Ayurveda even offers valuable tips on the care of lower gut bacteria. Microbiome research has clearly shown how important the lower gut and its flora are to our health and mental equilibrium. The great significance of the lower gut, digestion and nutrition are nothing new to Ayurveda. In Ayurveda, nutrition is an important key to health. Today we can say that nutrition alters our microbiome, and a rich and varied diet promotes the very significant diversity and balance of our intestinal flora. At the same time, it is becoming increasingly clear to medical physicians that many problems simply can’t be solved with pills, given that diet and stress play such a huge and central role in the health of our lower gut. What is called for here is a more comprehensive approach that takes into account the whole person and its entire life. Ayurveda has offered us an approach such as this for a long time. This approach needs to be particularly concerned with how to strengthen a person’s health. We are confident that the subject of the microbiome and the latest discoveries associated with it will lead to a better understanding of the ancient knowledge of Ayurveda in modern medicine, such that it will use Ayurveda to help many people improve their health and wellbeing. During his fascinating presentation, Dr. Wallace used modern scientific language to convey ancient Ayurvedic knowledge. Ama can be explained, for example as the result of a disrupted microbiome, which allows undigested food, bacteria, or environmental toxins to enter the bloodstream. Ama can thereby activate the immune system and create inflammation and many different diseases. From the point of view of Ayurveda, a powerful agni is capable of burning ama and is the key to good health. Our current knowledge of the comprehensive power of the microbiome seems to substantiate this claim. The ancient Ayurvedic writings cite many suitable measures for strengthening the digestive fire. Thanks to microbiome research, we can now better explain the effects of certain herbs and spices, such as turmeric, brahmi and ashwagandha. Recent studies explain how turmeric interacts with lower gut bacteria to fine-tune various digestive processes, for example. Lifestyle changes that support the lower gut, such as not smoking and taking enough time to relax. Caring for the lower gut is really worth it, as we can see from the example of probiotics, which can improve mental states like anxiety and depression. These days, anyone looking for recommendations for a healthy diet is often confronted with numerous trends and pieces of advice that are sometimes difficult for the individual to assess. From its wealth of experience over millennia, the science of Ayurveda can help us better find our way through the jungle of modern nutritional trends. An individual’s tolerance for various foods is a very important issue, and Ayurveda has always offered tailor-made nutritional recommendations that take every dosha or mind-body type into account. Based on dosha type, as well as the particular season and time of day, Ayurveda also provides valuable tips on how to optimally prepare foods in order to make them easier to digest. Temperature and the correct herbs and spices also play an important role here. Ayurveda recommends intermittent fasting, but only for certain dosha types. And in the context of modern microbiome research, even fasting appears in a new light. Light fasting, properly carried out, may possibly be able to stimulate the lower gut microbiome and, from an Ayurvedic perspective, would strengthen and reignite the crucial agni. Herbal infusions care for the intestinal flora and are among the most effective treatments of an Ayurvedic panchakarma program. In the Charaka Samhita, the oldest Ayurveda textbook, there is even a statement that 50% of all diseases can be cured by basti therapy. By the way, one of the most widespread and popular plant products in Europe is Indian psyllium or Indian plantain, which is a relative of European ribwort plantain. These small boat-shaped seeds are used in Ayurveda to rebalance the intestine; they also bind water and waste products in the lower gut. In addition to nutrition, Ayurveda provides a valuable impetus for a lifestyle that benefits the intestinal flora, such as making allowances for daily and seasonal rhythms, as well as for movement and relaxation. Dr. Wallace also emphasizes the role of consciousness, which Maharishi Mahesh Yogi brought new life to as an important component of Ayurveda. When people are stressed, it is difficult for them to make lifestyle changes. They often tend to compensate for stress by spoiling themselves with sweets, alcohol, cigarettes or spicy foods. Ayurveda offers yoga and meditation as alternatives that promote deep rest and relaxation, relieve stress, purify the mind and consciousness, and pave the way for change. Finally, it is fitting for us to learn which foods are particularly helpful on our personal path to self-realization. For many years, Dr. Robert Keith Wallace, a physiologist and adherent of Ayurveda, has provided a bridge between modern science and Ayurveda. 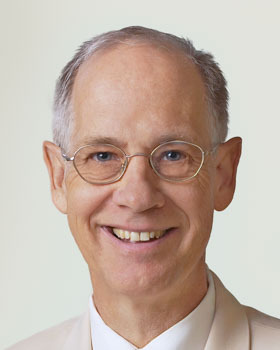 The very first Western scientist to investigate the effects of Transcendental Meditation on the body, he has authored many books and directed research at Harvard University from time to time. He was in close contact with Maharishi Mahesh Yogi, founded the first Maharishi Ayurvedic Health Center in the USA, and then was the founding president of the Maharishi University of Management. As professor of physiology and health, Dr. Wallace still works at this institution today as a research director, making a significant contribution to research and training in the field of Ayurveda. Robert Keith Wallace, Samantha Wallace: Gut Crisis: How Diet, Probiotics, and Friendly Bacteria Help You Lose Weight and Heal Your Body and Mind, Dharma Publications, can be ordered through Amazon. A guide to lower gut health: This book enlightens the reader on the most significant disturbances in the intestinal flora and the potential effects on our health. In an entirely practical way, it also shows how we can strengthen our microbiome on the basis of ancient Ayurvedic science through nutrition, lifestyle and other simple measures.